Toronto – After last Friday night’s Sonny Rollins show, I decided to high-tail it over to Toronto Jazz Festival headquarters at Nathan Phillips Square to check in on Sharon Jones. Thankfully I was able to catch the last half of the set. Even though Sharon is appearing on Day 1 of the festival, it was apparent from the packed tent of happy dancers that this show was going to be a festival highlight. It’s clear from the crowd that Sharon and her Dap-Kings were able to strike a resonant chord with her impressive pipes, her effervescent stage presence, and a top-notch band that knows how to will a crowd to their feet. 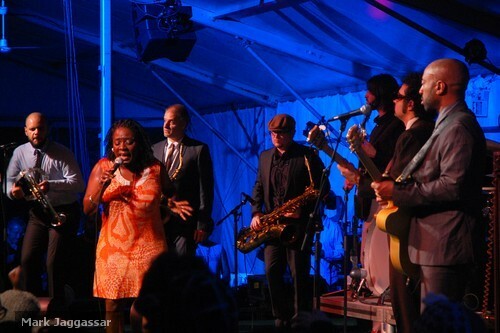 Sharon Jones was in Toronto last October promoting her latest album 100 Days, 100 Nights. It was a fun show (coverage here), but the less then stellar venue that is the Kool Haus limited her audience to die-hard soul fans that were already familiar with her work. Thankfully, Sharon Jones really got the opportunity to stretch her legs in front of a larger and uninitiated audience at the jazz fest. This included a whole gaggle of people just outside of the main tent soaking up some of Sharon’s crazy energetic stage presence for the first time. 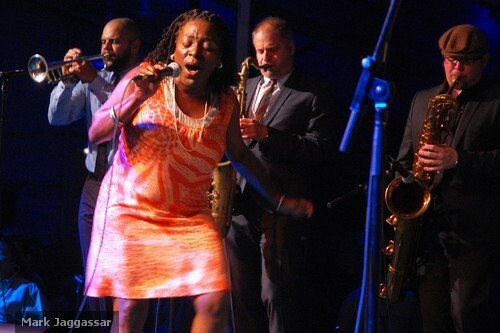 Sharon is backed by the Dap-Kings, a tight group of old-school soul & funk revivalists. The ringleader is the understated and cool Bosco Mann, the bassist behind the scenes that keeps things funky. This band produces a consistent and driving funk sound that will keep people happily dancing for hours. One highlight for many was Sharon’s tribute to Michael Jackson with a rendition of I Want You Back. Since I didn’t cover the entire show, I’m not going to rate this one. However, it’s clear from the crowd that Sharon and her Dap-Kings were able to strike a resonant chord with her impressive pipes, her effervescent stage presence, and a top-notch band that knows how to will a crowd to their feet. 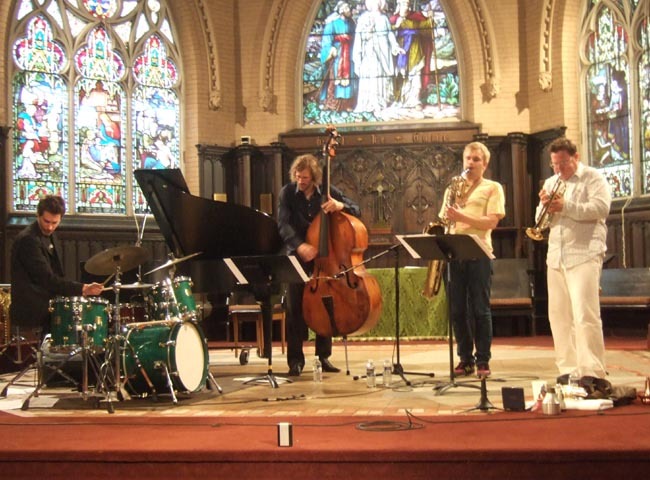 Toronto – A seasoned and talented jazz quartet with a couple of critically acclaimed albums under their belt. An intimate venue with great acoustics mere steps from the subway line. A reasonable ticket price as part of the Toronto Jazz Festival. So why were there only about 10 people in the crowd for Delerium’s wonderful show at Church of the Redeemer on Saturday night? It certainly wasn’t the band’s fault. I love jazz shows because it’s a treat to see a talented jazz musician on stage, the way they can play at a level that seems otherworldly to those, such as myself, who are distinctly lacking in musical talent. It’s an even greater treat to see a jazz group of great musicians who’ve been playing together for a long time; the way they’re able to read and play off each other, to send cues to one another with the merest nod or wave. And Delerium are exactly that: a quartet of great musicians. Every band member had the chance to shine with multiple solos throughout the night, and never missed a beat when they played in concert, especially Mikko Innanen on sax and Kasper Tranberg on cornet, who often went from extended solos straight into perfect harmony. During their 70-minute set Tranberg charmed the crowd with his playing, switching between multiple bells and mutes, going from soft, mourning sounds to loud wails in an instant, and with his between-song banter. Tranberg had some interesting things to say about every composition, particularly one who’s lengthy title I can’t remember enough of to do justice that he said was written by the composer as he walked down the street and inspired by, among other things, “the Dorsey brothers, as in Tommy Dorsey and his orchestra; of course, by mosquitoes; and by ZZ Top.” And damned if every one of those influences weren’t easily recognizable, especially the mosquitoes. Tranberg (seen on the far right of the picture above) certainly charmed me, but I may be a sucker for a slightly nerdy looking cornet player with a Danish accent. I smiled, looked on in wonder, and tapped my feet through the band’s entire set. My lovely companion, meanwhile, who would certainly describe herself as less of a jazz fan than I, thoroughly enjoyed the show, and was also struck by bassist Jonas Westergaard’s massive hands. When Tranberg introduced a composition by Westergaard as being “inspired by the territory of North America,” she was inspired to reply from our spot in the front row “that’s an awfully big territory,” which seemed to give the band a good laugh. “Maybe after listening you can help us narrow it down,” suggested Tranberg. Their sound is remarkably varied. Sometimes they invoke the slightly abstract solos of an Ornette Coleman or perhaps Sun Ra, but at others invoke the more melodic stylings of someone like Charlie Parker. With the mention of the Dorsey brothers as an influence on one song and Tranberg telling us another was a tribute to both Thelonious Monk and Tomasz Stanko, Delerium is a band with a clear understanding of their jazz history, while still managing to create music all their own. Fortunate as I feel to be one of the few who saw them, I felt a little bad for the band for playing to such a small crowd. Can I explain the low turnout for Delerium’s show at the beautiful Church of the Redeemer, an Anglican church right at the corner of Bloor and Avenue Road? I wish I could. Maybe people didn’t know where the venue was. Maybe more and more people expect more mainstream acts in their jazz festivals. My companion remarked, though, sometimes it’s nice to see a jazz band at a jazz festival, especially one as talented and polished as Delerium. This is Delerium’s first tour of North America. They’re on the jazz festival circuit, with their stop in Toronto coming after festival dates in Rochester and Ottawa. Some bands might be discouraged by such a small turnout early in their tour, but bassist Jonas Westergaard wasn’t. I just hope the low turnout doesn’t sour them on coming back to Toronto. See their shows during the rest of their tour, many of which are free as part of other jazz fests, so that they come back to North America some day. Toronto – The Downtown Toronto Jazz festival kicked off yesterday and will be running throughout the city from now until July 5th. It’s a fantastic opportunity to check out some great live music. The shows that occur during the day at Nathan Phillips Square are free. You can get the details here. Now, before I go describing last night’s show, I’d like to take this opportunity to talk jazz. To the layperson, there’s a huge swathe of music that we describe as “jazz”, but it can be helpful to understand the progression of the different styles. Jazz has had a profound and co-mingling impact on all sorts of music; from soul, afrobeat, calypso, latin music to electronica, hip-hop and beyond. When you think hard bop, think cats, literally cats. If a bunch of cartoon cats were to get together and play some jazz music in a Bugs Bunny cartoon or that Disney movie the Aristocats, that’s hard bop. This is where it all begins. Before this time jazz was popular dance music and musicians were seen as entertainers. Then cats like Charlie Parker and Dizzy Gillespie started to explore the idea that jazz musicians were artists first and entertainers second. Bebop is often seen as the roots of jazz. The music is angular and fast, the melodies are intricate, and it relies heavily on the musicians “chops” (virtuosity) and their ability to say a lot of things very quickly. While not as easy to digest as the later styles, bebop lays the foundations for the House That Jazz Built. Hard bop is a bit of misnomer. Despite the name, it’s bebop infused with elements of R&B and gospel, paving the way for funk and soul music. When you think hard bop, think cats, literally cats. If a bunch of cartoon cats were to get together and play some jazz music in a Bugs Bunny cartoon or that Disney movie the Aristocats, that’s hard bop. Hard bop is the jazz music that you can tap your foot to. It’s a lot more accessible and rhythmical than bebop, and has been incredibly influential on improvisational music of all sorts. OK so let’s say you’re aiming to steal the Hope Diamond, so you put your sneakers on, you know, for sneaking. [What do you listen to?] cool jazz. OK so let’s say you’re aiming to steal the Hope Diamond, so you put your sneakers on, you know, for sneaking. Like all successful diamond thieves, you need to get into the right frame of mind before you pull off your caper, so what music do you put on? For the high-minded antiquity thief, there’s really only option: cool jazz. Think drums that are being played with metal brushes. In cool jazz, musicians drift just behind the beat to give the music a laidback, cool feeling. So now that we’ve covered some basic terminology, it’s important to establish that these styles mingle with each other. Musicians don’t really spend a lot of time thinking about classifications. They think about music and ideas and how to incorporate the two. We just invent these terms to help us talk about their music. So Miles Davis and his seminal album Kind of Blue is the perennial example of cool jazz, but that doesn’t mean that you can’t find earlier works of his that are bebop, or later works that are closer to hard bop or rock fusion. Sonny is a grandmaster that has earned the respect of top jazz musicians and critics 50 years ago … he continues to practice his craft in the most dilligent and humble of ways; this man is a class act. OK, so now we’ve got all the tools we need to talk about Sonny Rollins. Born in 1930 in Harlem, NYC, Sonny started on alto sax, but moved to the tenor at 16 . By the time he hit his late teens, he was playing with the pre-eminent artists of the bebop movement: Thelonious Monk, Bud Powell, and a young Miles Davis. Simply put, Sonny is a grandmaster that has earned the respect of top jazz musicians and critics 50 years ago. At 78, he continues to practice his craft in the most dilligent and humble of ways; this man is a class act. Sonny’s set practically started with a standing ovation just after 8 pm at the Four Seasons Centre. The first half of his set could best be described as a traditional bebop. It was driving and his 20-minute opening song was inspired. Sonny has a lot to say musically and is still firmly in command of his horn. After the first song though, Sonny and his band kept progressing in the bebop direction. The crowd was happy to be seeing Sonny Rollins live, but most seemed to be yearning for more foot-tapping music. As is often the case in the jazz world, the second half of the set is where things really picked up. Sonny started moving towards hard bop fare, and it is here where he shines and the crowd starts to groove. Sonny’s sense of phrasing and his ability to play with your rythmic expections is without par. This is especially evident when he re-interprets old calypso tunes. One highlight for me was his song Cutie, which is a fantastic example of the softer and more introspective version of Sonny.